I’m Jamie, a 36 year old Headteacher from High Wycombe. This time last year I was 4 stone heavier, and quite unhealthy. I was suffering from an underactive thyroid, though I didn’t know it at the time. It was quite a low point in my life, as my physical health was affecting my mental health. My mind was foggy, concentrating was hard, and I struggled with the resilience needed for my job. I’d almost started to accept feeling tired all the time, and being unable to live the life I wanted to live. January 2016 saw the beginning of a big change for me. I decided not to accept my fate, but to do something about it. The first step was to talk. I was lucky to have a strong support network of friends and family, and also the support of the Place2Be charity in my school. Place2Be offers play based counselling to children in schools, and is a massive support to the whole community, including headteachers! My school, Viking Primary, has used the service for years and we couldn’t be without it. Through opening up about how I was feeling, it became clear I needed to focus on my mental and physical health and take better care of myself. I repeatedly visited my GP for support on my medical issues, and once I was diagnosed and started receiving treatment I got into exercise in a big way. A good friend, Claire, encouraged me to go running (her hobby) after I discussed my difficulties with her. I can still remember how patient she was of me; puffing away and moving at a snail’s pace just to run a few times round the park!She taught me not to judge myself against anyone else’s standards, and to just ‘be the best I can be’. I stopped worrying what I looked like, or what others thought of me. Soon the time we spent running and talking became a sort of catharsis for us both. I got to looking forward to our runs; specifically that Claire would listen without judging. I would talk about work, family, my body issues… anything really. Just having someone there helped me to remain motivated and committed. At first exercise was HARD WORK! I would look around the gym or park, and everyone seemed fitter than me. The hardest part was to get into a routine, and not use a late finish at work or a bit of traffic as an excuse to skip the gym. Once I had been regularly going for a month or so I noticed that I felt re-energised, more able to focus on work and home life, and just generally more positive and resilient. I had grown too in self-confidence, as I was being honest with everyone about my struggles and my successes. In October I ran my first half marathon, and couldn’t believe the positive effects of the exercise both on my body and my mind. I was now doing things I’d never have considered a guy like me doing, let alone enjoying! My running went from strength to strength as I built up my fitness. I progressed from the local park to timed events, such as Parkrun and 10k races. In assemblies I would talk to the children about mental and physical health, the link between the two, and the importance of support in order to achieve your goals; all based around my personal experiences. I enjoyed being able to use my experiences to start supporting others. So today I have vastly improved mental and physical health, all thanks to the support of friends, family and mental health charities. It’s been a tough year, with lots of potential pitfalls along the way, but I’ve plodded on little by little every day. The main advice I would give anyone is that with support, you can do anything. A friend the other day said I was an inspiration, but I don’t think I’m anything special. All I did was start talking. And I would encourage everyone to do the same. Start talking. Keep talking. Don’t shut up! You’ll soon find a friend who can support, inspire and help you. I’m hoping I can be that friend to someone too. 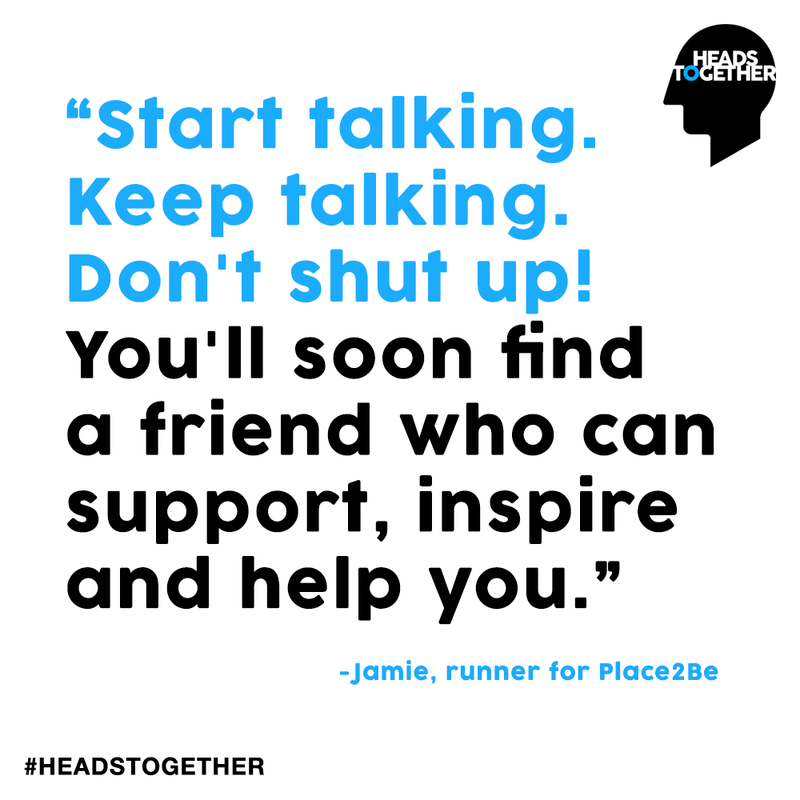 That’s why I am proud to talk about mental health and run for Heads Together at this year’s London Marathon. Want to find out more about the charity Jamie is running for? Learn all about our charity partner Place2Be here.